Back in May 2017, we saw a tour of the Ideal Marketplace in half of a former Pathmark in the Botany Village section in Clifton. In New Jersey. In the United States. In North America. Get the picture? 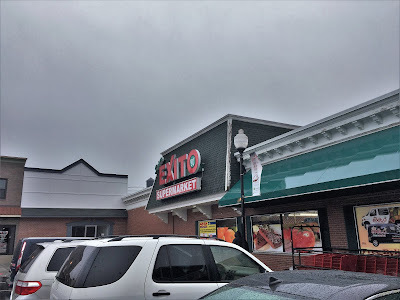 We're heading back to that area again, this time to check out a neighborhood fixture, the Super Exito Supermarket in the Botany Village plaza. This store is an interesting situation. The name is in Spanish, and the music was Latin music. However, most of the international foods were from Europe, especially eastern Europe. Plus, the owner, Jay Patel, is Indian. I've never seen anything like it! On the other hand, a commercial for one of Exito's other locations pronounces the name "ehks-EE-toe", not "EHKS-ee-toe", as the word for success is pronounced in Spanish, so either the voice actor couldn't speak Spanish, or the name doesn't actually refer to the word in Spanish. This store was previously an A&P, although Exito has probably been here for at least 15-20 years. A Met Foods also previously occupied the space before Exito. It's clearly less polished than Ideal, although it's probably more popular. Funny that the sign is on the complete opposite end of the storefront from the entrance. Here we see not only pictures of Exito delivery vans, but the Exito delivery vans parked in the parking lot! Exito has rebranded under the name Exito Freshmarket and now has locations in Jersey City, Freehold, Newark, Long Branch, and West Long Branch. 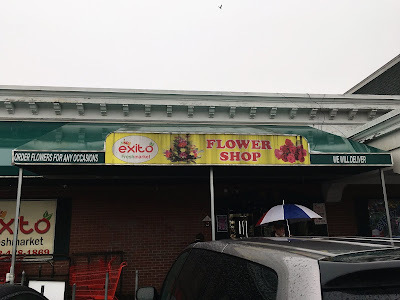 This store's facade still says Super Exito, but the circular says Exito Freshmarket. Yeah, but Acme sells all my Macedonian favorites for much lower prices. (My apologies to all the residents of Macedonia, but I couldn't point it out on a map.) Where else can you get this variety in a single supermarket?!?! The main (and only) entrance is actually here under the Flower Shop awning. 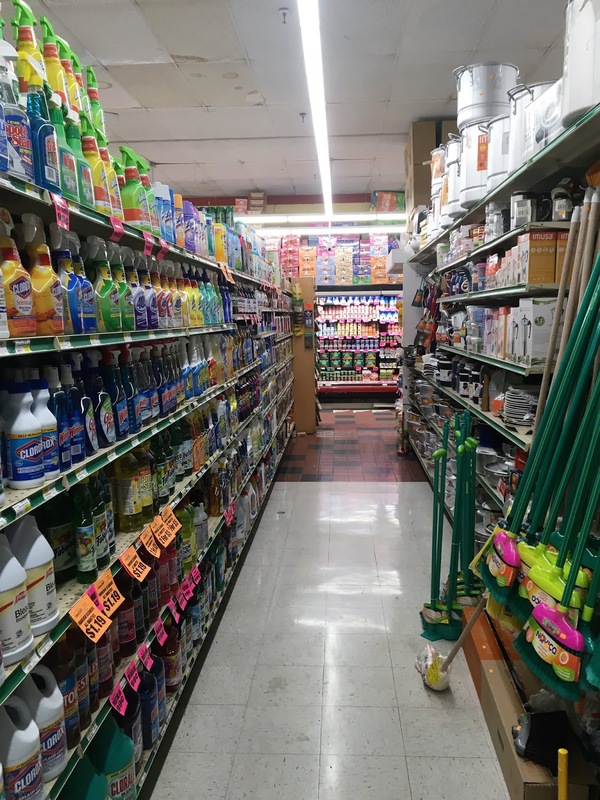 The first two aisles are produce and sales. The case in the center has produce stocked on both sides, but it actually stretches the full length of the aisle, so it's really two aisles here. This center fixture is very old. The refrigerator cases along the wall look newer, but this center case is from the 70s at least. Produce lines the first aisle, with dairy and meat along the back wall and service seafood, deli, and butcher in the last aisle. It's a little inconvenient to go all the way around the long produce case, but hey, we can use the exercise. Customer service is visible straight ahead. Here's a cluttered look at the cluttered customer service counter. The mirrored area is the manager's office. I was previously warned (from a reliable source, too) that photography would be difficult in this store due to security, but on my visit there was no security whatsoever. Or they just stayed in hiding and have been secretly tracking me since. You never know. Anyway. Dairy and cold cuts occupy the corner at the back of the produce aisle. The back wall is to the left here. The floor is crazy but it's all part of the experience -- I wouldn't want it to be changed a bit! Dairy continues along the back wall, and you can see where the packaged meats section begins on the right side. The flooring in the grocery aisles is more standard, with solid white tiles. 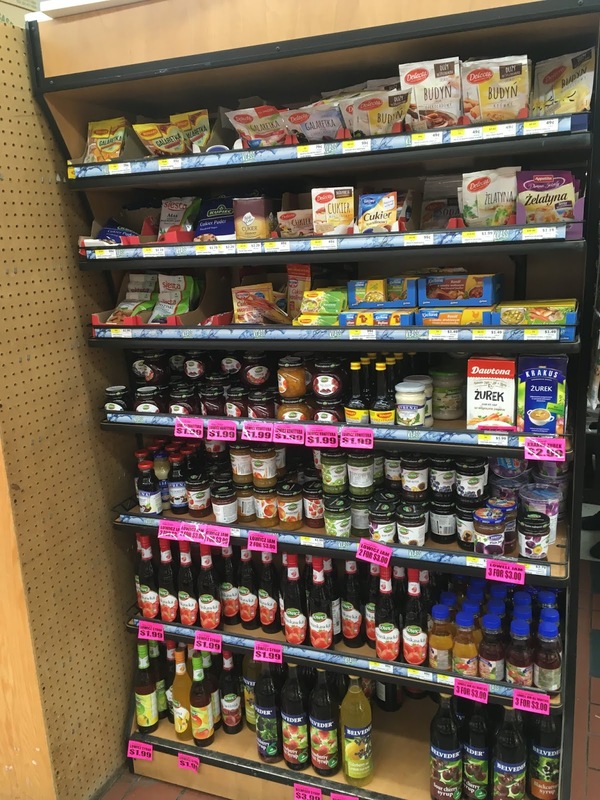 The store also had a large selection of nonfoods, although almost no HABA. And unlike some other stores, nonfoods are in the early aisles, not on the far side of the store. We also see that the owners got . . . creative with the aisle markers. 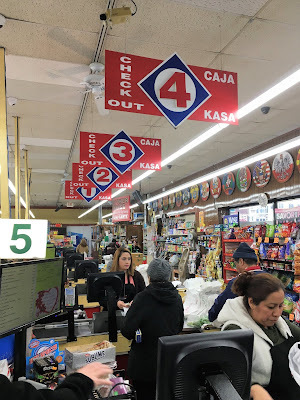 Not sure if these aisle markers came from a different store, or if they're left over from A&P even -- they look vaguely A&P-type, and the Super Exito sign looks to be added later. These aisle markers look similar in style to A&P Sav-A-Center, although they may just be later generic aisle markers added by Exito in the same color scheme. We also see some unusual endcaps on the aisles. 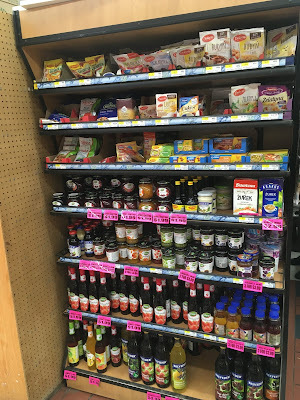 This one is all Polish foods, and the Polish selection continues along one of the grocery aisles. Each country is clearly marked by a circle sign showing that country's flags. Great, if you know your international flags. And if not, study up. 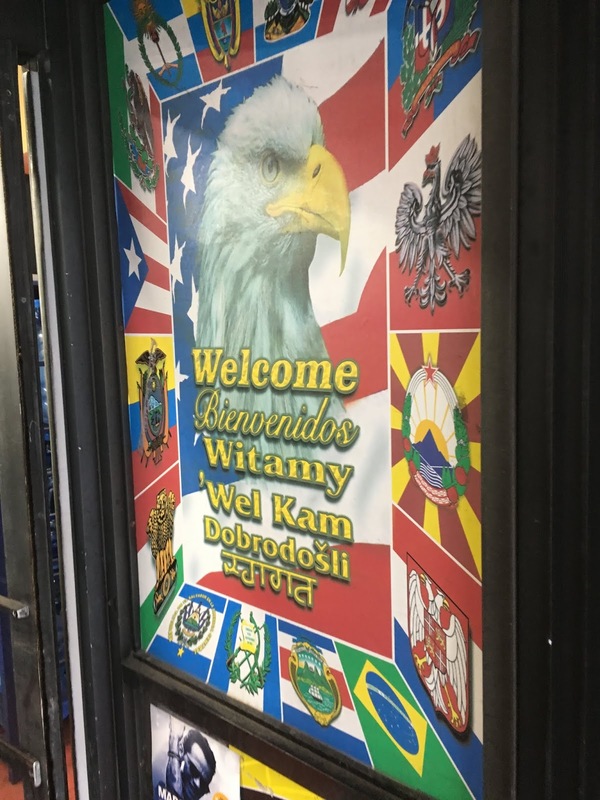 Highly diverse selections abound here, with a focus on eastern Europe and central and south America, although other parts of the world are represented as well. The merchandise is stocked almost to the (fairly low) ceiling, so it's not exactly a spacious feeling store. The off-center aisle marker that's been cut for the light fixture. The dingy ceiling. The randomly-placed ceiling fan. The fact that this is only one of the international aisles here. How can you not love this store? Aisle six is looking a little better, but also a little more cramped. I don't know if these circular signs were installed by Exito or if they were secondhand from elsewhere (although I can't imagine where else would be so specific). Yes, some aisle markers are missing their numbers, and you maybe should wear a hard hat walking under others. But show me where else you can find a supermarket with the selection and personality of this one! Although I wouldn't necessarily model my supermarket's organization on Exito's. Unless you like to buy your frozen waffles and your paper towels at the same time. The aisles are very narrow, but they pack in a whole lot of selection, so I don't mind it too much when the store isn't crowded. The seafood department is the first service counter in the last aisle. It's a little too blurry to read, but the yellow and red price signs are actually those of AIM (the Association of Independent Merchants, a Krasdale-owned group), which you can see a close-up of at Little Apple Market in Allentown, PA here. This Exito is not (currently?) an AIM, but other Exitos are. In fact, Clifton shares a circular with Long Branch that advertises Parade products, despite the fact that Long Branch sells Krasdale. Meat and then deli continue along the last aisle, with a floral department in the front. The store's small HABA selection is also located in this front corner. Also notice the Edwards signs in the corner. We saw more of these at the Universal Supermarket in Rahway. I'll mention here that although the store does not have a bakery, it does receive locally-baked breads, focusing on Polish products, from various European bakeries in the area. The breads look fantastic. Multilingual checkout lane signs as well, pointing out a checkout (English), caja (Spanish), and kasa (Polish). I have to say I think this is the first time I've seen any supermarket signs with Polish on them. More circular country flags along the front end, plus potato chips. Huh? These checkout lane numbers (not the hanging signs) also look to be hand-me-downs from a chain supermarket, possibly either A&P or Edwards. If I remember correctly, you actually walk around the front of customer service to exit. Most stores have the exit on this side of customer service. And you have to love the wood paneling on the front wall here. 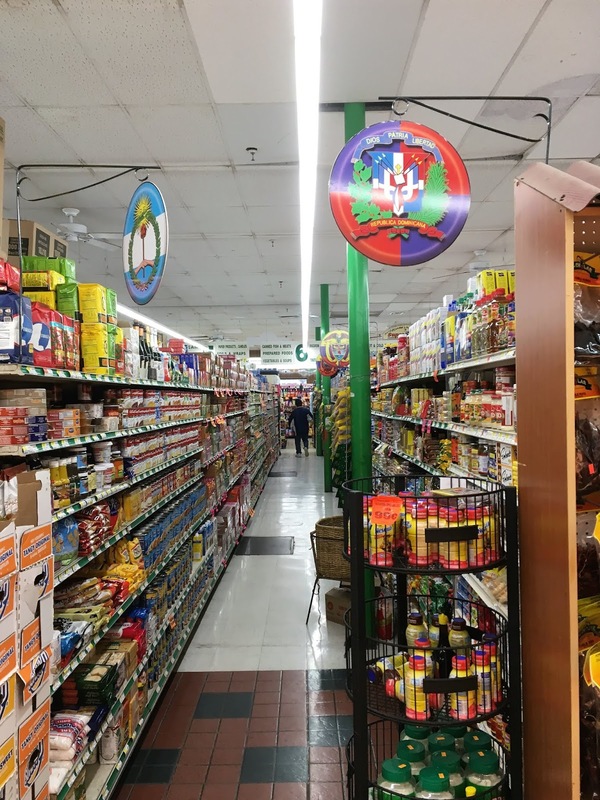 Walking into Super Exito feels more like walking into your grandparents' house than walking into a supermarket, which is not at all a bad thing. In fact, it's probably the only reason they could hold their own against Pathmark and continue to against Ideal, which more directly encroached on Exito's territory than Pathmark did. Because of its charm (I guess you'd call it that? 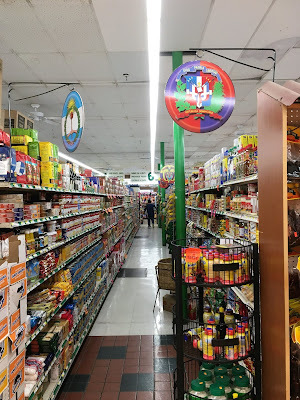 ), Exito is a must-see because there just aren't supermarkets like this anywhere else. Those checkout lights are definitely from A&P! They are from the mid 1980's. Edwards used lights with the Express option. OK, thanks for the info! That's what I thought. What about the aisle markers, can you recognize them? You're welcome! The aisle markers are most likely generics from a store decor company, or they were brought over from another independently-owned supermarket. The thing with the "Sav-A-Center" decor (of the early 90's you are speaking of, correct?) were mainly in black. Unless Exito replaced the removable signage in it, and repainted the base itself. Most likely the first option of generics. Ah, OK. So it's only coincidentally similar in design. I can picture the black signs you're talking about. Thanks!